Someone at the Salvation Army was not having a good day. But I certainly did. When I hauled my stack of clothes (which, by the way, I carried around like a pack mule because there were no carts left by the time I got to the thrift store) onto the counter, the clerk was decidedly nonplussed. So much so that she decided not to check individual price tags and just ring up my whole stack — minus a piece of fabric — at 49 cents apiece. I realize the ethical thing to do would have been to go back in after realizing the discrepancy and demand that they take more of my money. But ... that's not what happened. I bought this with an eye toward selling it, but it's in really lousy condition, so I am thinking about attempting a refashion. Maybe a sleeveless bow blouse? Good or bad buy: Not if I don't actually do anything with it. I love the bold, abstract print of this dress, and also the color combo. The fabric is super soft and has a great drape to it. It probably used to have a matching belt, but hey, life happens. Keep or sell: Sell ... ? I've been stalking this skirt for a few weeks, and snatched it when I saw it had been marked down. There is just something about the color combo and the striped ruffle hem that I positively love. I've put it in my spring/summer consignment stash, but I have a feeling I am going to have to at least model it before I can let it go. This is such a classic, pretty dress. I tried it on the other day and it looks waaay better on than it does on the hanger, so I may have to model it before listing it in the shop. I was literally just thinking the other day that I wanted a pair of leather leggings, or leggings with leather details. Ta-da! These are on the small side, so I definitely will NOT be wearing them as pants, but I am excited to try them out under tunics and dresses. OK, I realize this hanger presentation looks kind of weird, but so it goes. These are destined for consignment in the spring — they're in perfect condition, and so pretty! I can't pass up anything that looks like a prom dress from the 1960s or thereabouts if it's in reasonably good condition, which this one is. Good or bad buy: Good buy — I will definitely have to get this one on the dress form to show it off to its best advantage. Why do I love this dress? I'm not sure, but I absolutely do. Maybe it's the faux-patent leather belt. Maybe it's the bias stripes. Maybe it's the decorative buttons on the shoulder. I don't know. But I love it! I'll be honest, I'm tempted to keep this, because I like the length and cut of it. But it's a bit on the small side, so off to the shop it goes. Good or bad buy: Good buy — I mean, who couldn't use some more leopard print in their closet? My requisite moment of insanity. I had no plan when I bought this, but I think the print is really beautiful. However, the cut of this dress is not really my thing, and the brand is one that my local consignment store won't touch. So I am thinking maybe a re-fashion? A classic! It's also super tiny, so I suspect it might be a child's size. This pretty blouse would look so cute under a sleeveless dress, or with a suspender skirt. Another one for the spring/summer consignment stash, this cute little linen skirt would look perfect with an oxford shirt and loafers. I was pretty stoked to find some fabric that isn't cotton! I love the rich color of this faux suede, and I'm excitedly thinking about what kind of dress I'd like to make with it. I love this super chic skirt, with its high waist and welt pockets. Too bad it's a size 2 or I would totally consider keeping it! Instead, it's off to consignment. 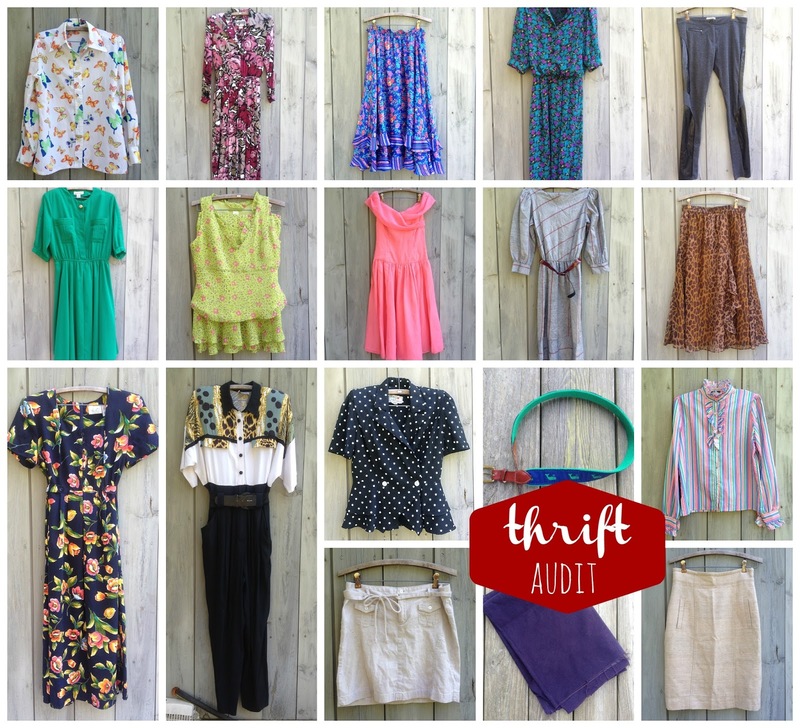 A few missteps here, but overall, I got some good items, with a mix of vintage and consignment. I just have to push myself to actually do something with those two dubious pieces. And thanks to the Salvation Army clerk who was having a bad day! What a good bagful! I am now fascinated as to where that floral maxi is from - what brand with great fabrics will your consignment store not touch? I was trying to remember! It is one of the Walmart brands, I think - there are only a couple women's clothing stores in my town, so the shop gets kind of overwhelmed with those brands and generally doesn't take them on consignment. Hmm... I'm gonna have to try this shopping method next time I hit up a Salvation Army.Usually the only time the thrift store sees me with a big stack of clothes is on a sale day, though. I'm kind of floored by that vintage pink dress! Holy cow is it gorgeous (for a solid colored dress, y'know?). Ha ha, well, I definitely don't recommend it as a thrifting strategy! And I'm the same way - this was on Monday, when certain tags are marked down to 49 cents (hence the checker ringing everything up at that price). Otherwise there is NO way I would be buying this much stuff!